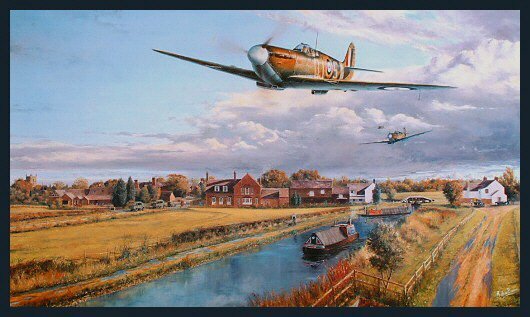 The calm of an English village is momentarily shattered as Spitfire Vbs of 92 Squadron flash overhead, having been scrambled to intercept a Luftwaffe raid during the summer of 1941. R J Mitchell’s beautiful and timeless design, coupled with its pivotal and glorious role in the Battle of Britain, has turned the Supermarine Spitfire into an aviation legend that endures to this day. There can be few experiences more stirring than the sight and sound of Merlin powered Spitfires at treetop height.